Do I really need to describe these? 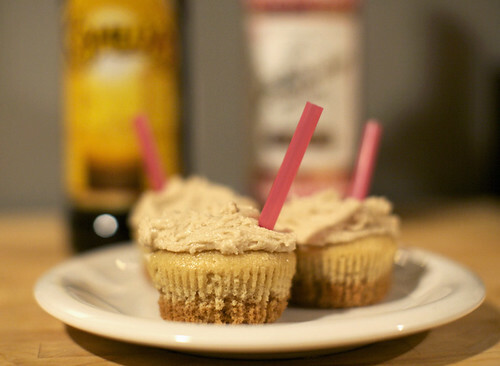 White Russian in a cupcake. I’m just gonna go ahead and give you the recipe. Beware this frosting is deadly. Preheat the oven to 350°. Fill cupcake tray with liners. The trick with this recipe is to make both batters at the same time. That means mix all your wet ingredients and all your dry ingredients for both batches simultaneously and then combine them both together. That means you should be working with four bowls. Mix soy milk and vinegar and set aside. Combine all the dry ingredients for both batters in two separate bowls. In two more bowls, combine all wet ingredients adding the soy milk mixture last. Mix the wet and dry for the Kahlua batter until there aren’t an noticeable lumps. Divide between the 12 cups. Then mix wet and dry for the creme mixture and fill the cups the remaining 3/4 full. Bake for 20 minutes or until a toothpick inserted comes out clean. Let cool on a rack completely. For the frosting, beat the Earth Balance until smooth. Add the Kahlua and vodka and beat until fully combined. Add 1 cup of powdered sugar and beat until smooth again. Add more powdered sugar as necessary. A note on this, I used the soy free Earth Balance which is not as dense as the regular stuff so I used 1 1/2 cup powdered sugar, I imagine only 1 cup will be needed though normally. Also, double the recipe if you want to pipe the frosting. Eat these suckers (but don’t eat too many)! indeed i do think heaven must be fully stocked with such things. not that heaven is really my thing. heaven on earth? Awesome cakes of alcoholic cuppiness. i may be about to go on an alcohol inspired cupcake making binge. so much fun in a little package. this is the best cupcake idea i’ve ever heard. AND i love how you stuck straws in the frosting. brilliant! Wow, those cupcakes sound fantastic! i want to get drunk on cupcakes!!! let me just say i may have ‘tested’ a fair amount of this batter. drunkcakes! These look AMAZING! I love white russians and I love cupcakes! Such a great idea to put them together. yes it does seem that they should have always been together! These cupcakes are so good. I can’t even believe it. yum, yum, yum. There is only 1 left from a dozen made last night. I want to eat it. Mmmm, I’m saving the recipe for the next time I make cupcakes! These are just begging to be made! They look yum! Without a doubt, the best cupcakes I have ever eaten.